It doesn’t take a lot of rain on parts of the Gold Coast for flooding to occur. Water inundation can create untold damage to homes and other structures that home owner will be dealing with for a long time to come. 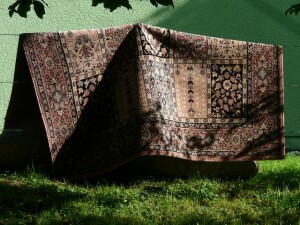 For many damaged structures, the carpet is one of many areas where you might be wondering if it can be salvaged at all. If you ever face this situation, please call us. Our technicians have experience in water-damaged-carpet restoration, and we will get to work right away to protect your valuable investment. You’d be surprised how often we can restore carpet to its original condition following even major water damage. Acting quickly is important for a number of reasons, most notably the prevention of mold growth. If you’ve also experienced a power outage—all too common following a storm—the risk is even higher, with a dark, warm environment making the perfect breeding ground for mold and mildew. We work fast to prevent that by taking a number of preventative steps including removing all the water with a professional-grade wet/dry vacuum and airing out the carpet and space with industrial fans. We’ll also replace the padding if necessary and steam clean thoroughly after we’re done. How do you know you’ve chosen the right carpet cleaning company to address your water-damaged carpet? For one, at Carpet Cleaning Gold Coast we understand that in many cases, this is a time of crisis. Flooding is one of the most destructive types of disasters your home will ever face, which is why we’re committed to restoring your water-damaged carpet in a way that not only leaves it looking great again but eliminates the risk of dangerous contaminants. At the same time, our services are not limited to extensive water damage. Leaking or burst pipes, roof leaks, or other causes can also result in water-damaged carpet. No matter how large or small the job, we treat each one the same—with prompt and professional work to restore your carpet and prevent mold growth, residual water stains and other problems down the road. Water damage of any kind in the home should always be taken seriously, especially when it comes to the carpet. But with the proper expertise, equipment and prompt action, we can usually restore your carpet safely and thoroughly, leaving you with one less thing to worry about. And you can rest assured we’ll care for your carpet and home just as though they were our own.